Building a raised bed garden is super easy and really not that expensive when you look at the over all cost less the money you save of your favorite vegetables. 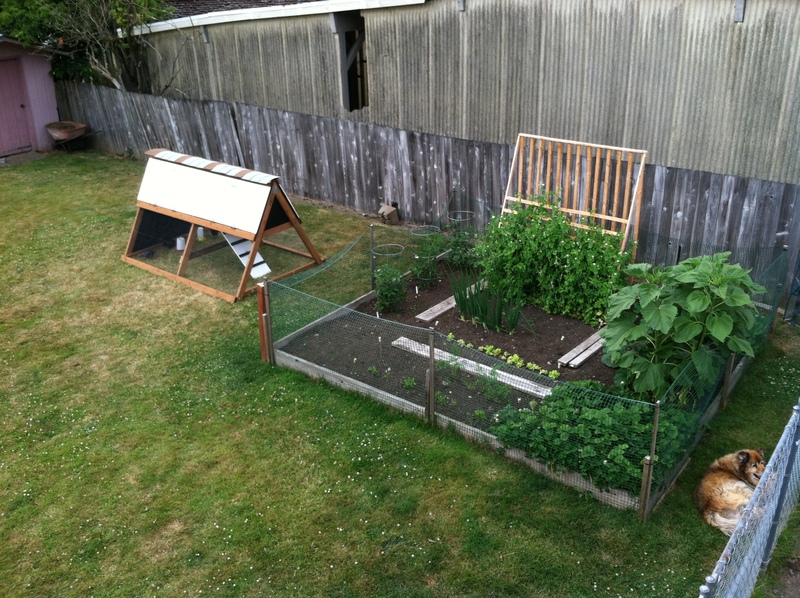 The garden we have here is made with 2 x 8 inch boards, and some plastic fencing to keep the dogs out. We built this 2 seasons ago, so this will be our 3rd season with this garden. We put about 5 yards of soil in this box. 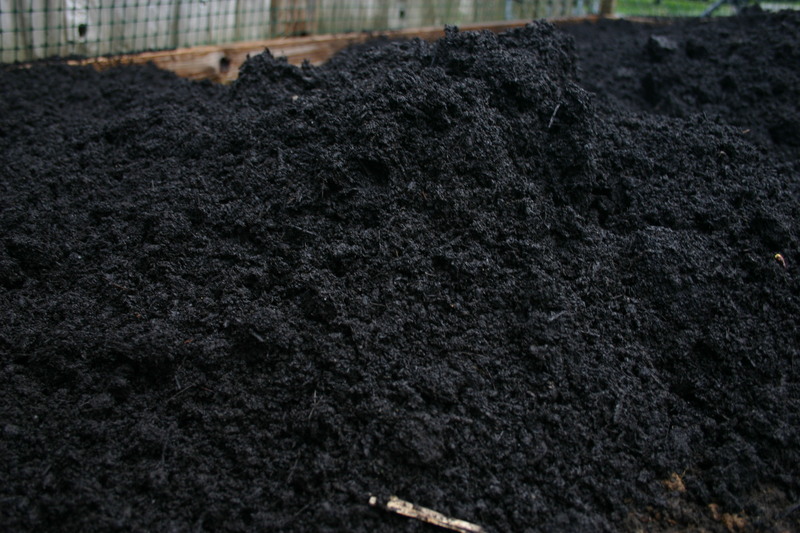 Some of it was from our compost and some we had to purchase. We planted it that way for 2 years. This is what it looked like the first year we used it. 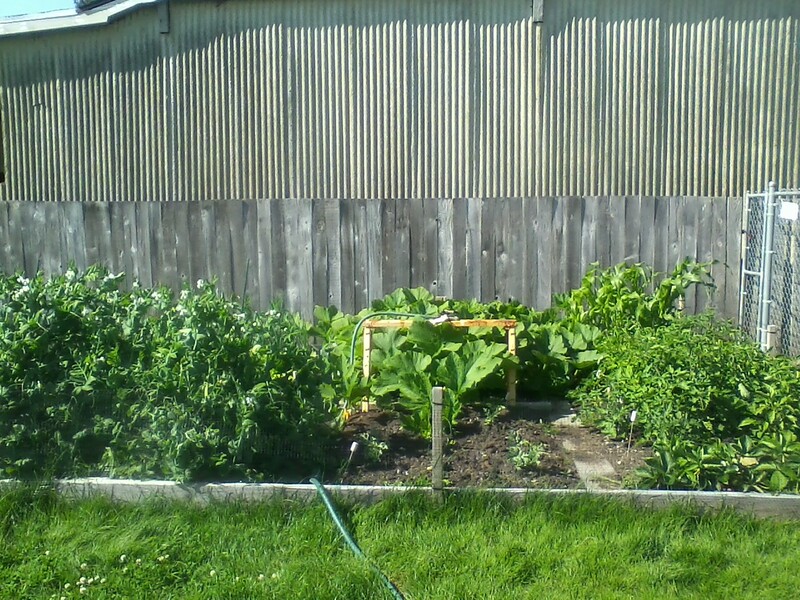 You really can’t tell what’s in there for sure, but I believe from left to right we have peas, pumpkin, corn, 4 tomato plants, strawberries and in the front middle we grew, lettuce and carrots. Wow what a crazy mess. Last year, we had things a bit more organized, but the pumpkin took over! 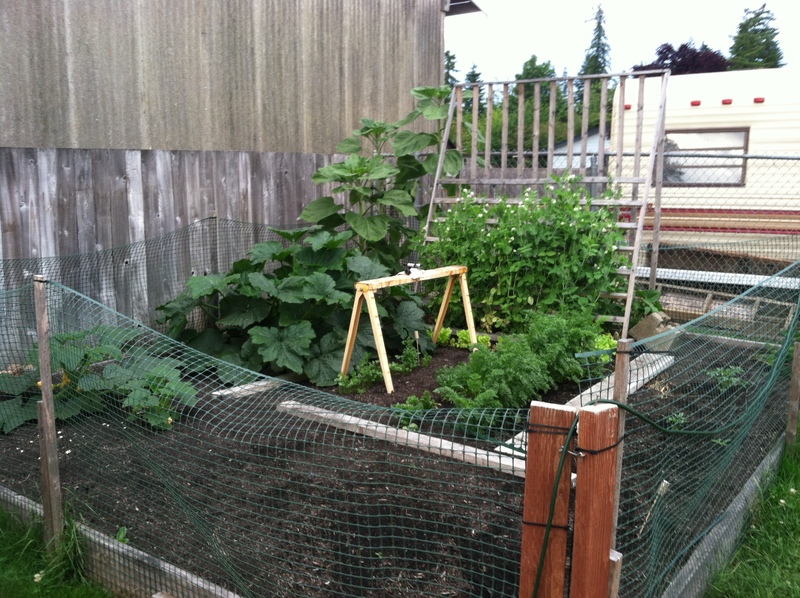 Although, you can see from left to right we have 3 contained tomatoes, beans and peas with the new trellis Jeffrey built, pumpkin, sunflower which you cannot see yet, then strawberries. In the front middle, we have onion, lettuce, spinach and carrots. This year we needed to fill it. 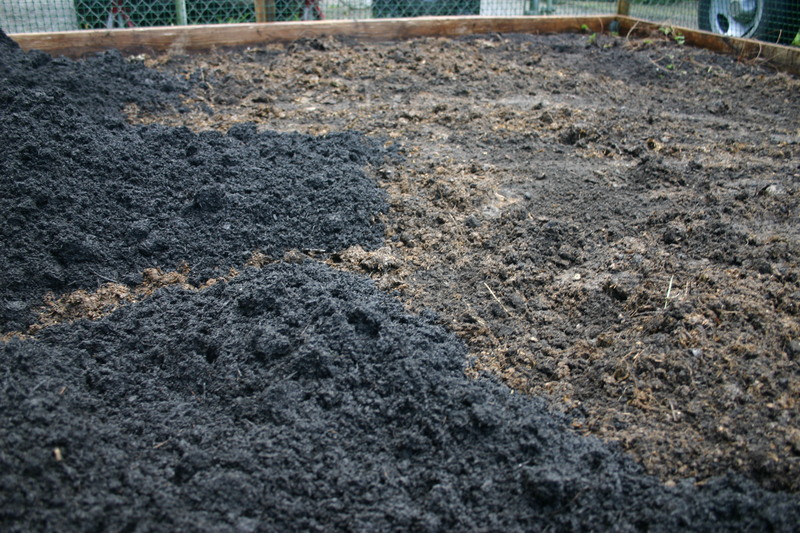 I had some chicken poo mixture from our hen house that we laid down, then we purchased about 2 yards of soil. This soil is mixed with bull poo. Look at that rich color! All that poo makes things grow really big and really fast!! We have here from left to right, yellow squash, zucchini, 3 sunflowers, peas and beans on the trellis, growing back strawberries and 2 tomato plants in front. 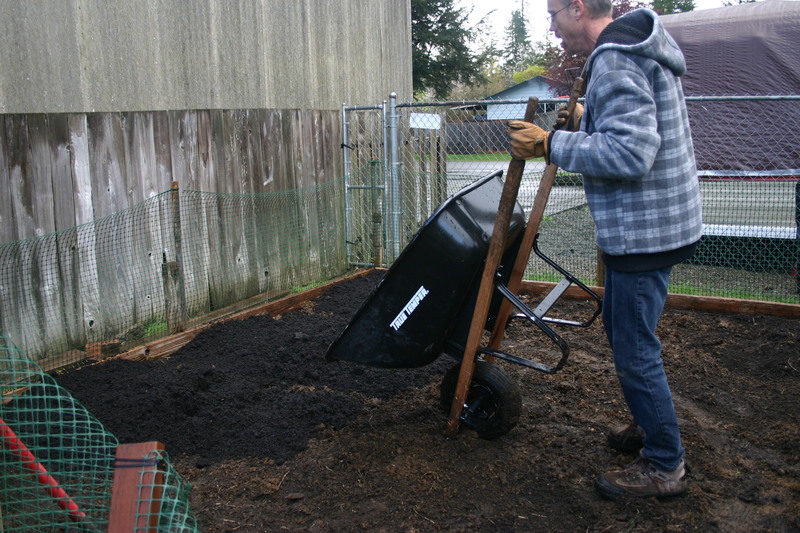 Then in the middle under the saw horse, I planted cilantro. YUMO!! 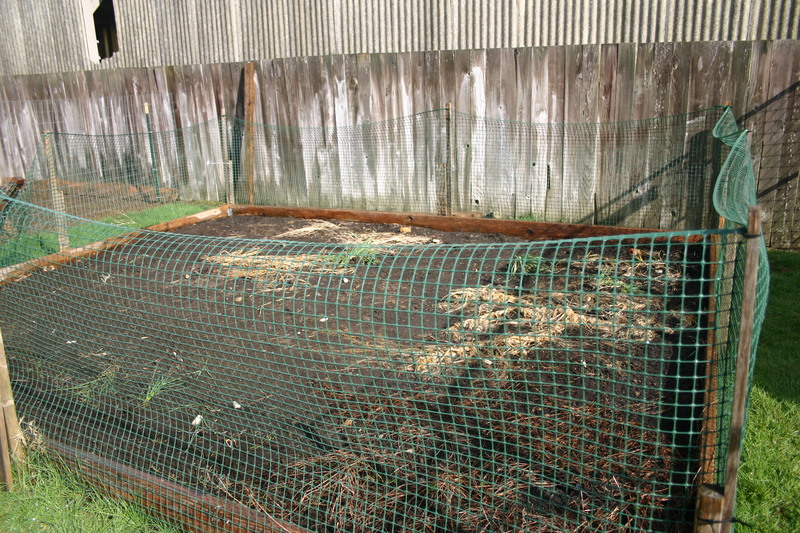 In front of the peas is lettuce, and in front of the cilantro is spinach and carrots. When my mom was here over the winter, we moved the hen house to the other side of the yard so we could fence in a section for her dog. Her dog doesn’t do well with other animals so this was a safe option for our dogs, and the chickens. When she went home in February, we moved the hen house back to it’s original spot and this spring, this is what we found growing were we had the hen house over the winter. Zucchini and pumpkin, together! Oh my those chickens! 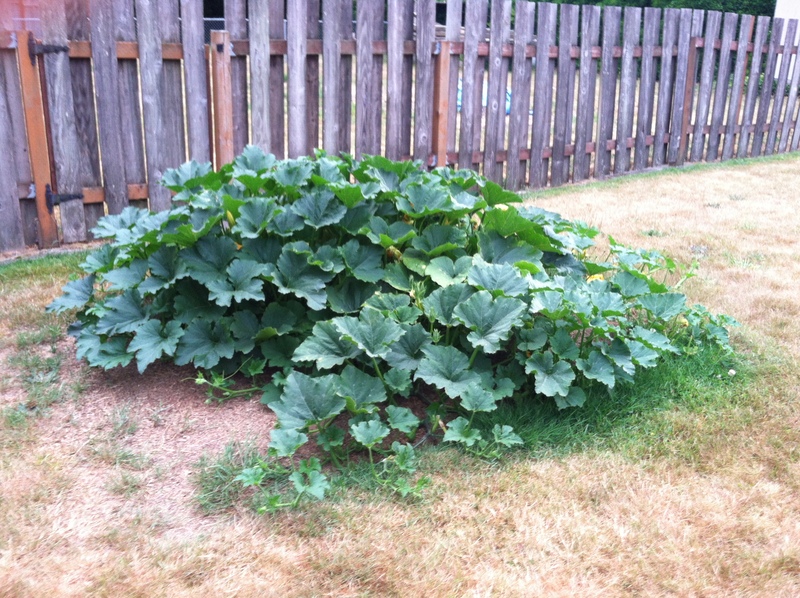 I had been feeding them zucchini and pumpkin apparently. So we have an over abundance of zucchini growing this year. Luckily, my good friend’s husband loves it and doesn’t care if they are enormous. He will cut them up and take them to work. We also saute lots of it and share with our hens. Here is what I picked 2 days ago. 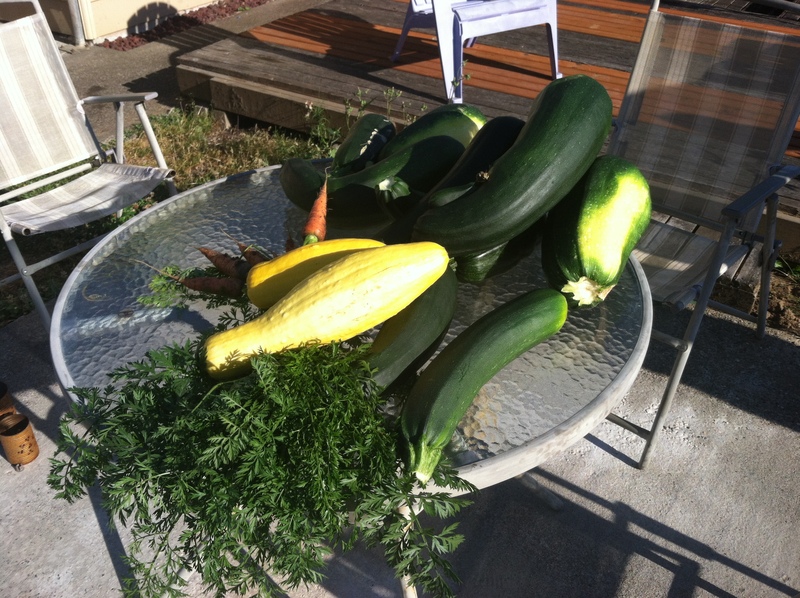 There are 8 or 9 zucchini, a hand full of carrots and 2 yellow squash. I have had tons of lettuce, spinach, carrots and cilantro already. We have even picked peas and beans so far this summer. The harvest has been plentiful. The Lord is good!